Welcome to ANNIE SAID SO! I’m Annie, a Utah-based Colombian-American, and I’ve been blogging about my adventures in the U.S. of A since the Summer of 2010. 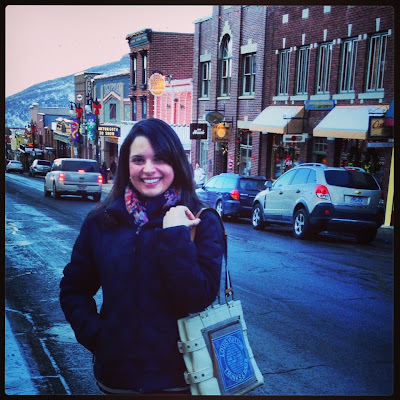 On Main Street in Park City, UT–i.e., home of the Sundance Film Festival! I live in downtown Salt Lake City, Utah and dream of attending grad school elsewhere while traveling all over the world in the near future. 1. What’s your disclosure policy? I’m glad you asked! Find my policies, terms & conditions, and disclaimers here. 2. Do you work with PR people? Do you review products? Do you attend events? Do you host giveaways? Do you accept advertising? Claro que YES, yes, yes, annnd yes to all of the above! Find out more about my Sponsorship options. 1. Where do you get your images? 2. What camera and photo editing software do you use? My fam and I shoot those photos I don’t get from the web with our Canon EOS Rebel T4i, Canon Powershot SX120 IS, and our iPhones. I usually edit my photos in Instagram, Photoshop, or PicMonkey (<<affiliate link). 3. You’re a Catholic living in UTAH! What is that like? 4. I’m coming to SLC! Where should I shop? Some Utahns also swear by “the DI” (a retailer of 2nd-hand stuff; there’s one near downtown. I’ve personally never been to the DI to shop for clothes BUT I’ve heard of many thrift lovers who enjoy the vintage treasures they find there. “But what if I want to find more affordable things?“ you might ask. Well then not to worry! There are a lot of budget-friendly stores there as well, such as H&M, GAP, AE, Forever 21, among others, plus a food court full of delish treats. Be sure to check out this post to learn about my experience of City Creek! If you’re done with City Creek but aren’t finished shopping (of course), then you’ll want to stop by the cute cafés and otherwise quirky shops in other areas of downtown: Visit the Gateway Mall, Trolley Square, Main Street (but between 4th South and North Temple), and Broadway (AKA “3rd South”–but between Main St. and 900ish East). Annnd don’t forget about my favorites, Nordstrom Rack and T.J.Maxx (both located in Sugarhouse). Make sure to always do a little Google mapping before you set out to plan out the shops you want to hit. …And WHAT should I pack? Like many cities in the States, SLC is known for its “bipolar” weather. (For instance, there were a bunch of 60s-70s days during Spring 2012 and there was only one inch of snow in January 2012. So whenever I travel I always (a) check the weather leading up to the trip and (b) bring walking shoes, layers (and more layers), an umbrella, and MANY options (!). You can read more about what I mean by “options” when it comes to Utah weather/fashion on this post I wrote about the bizarre winter of 2011-2012 and the fashion choices it involved. 5. I’m coming to gorgeous flavorful Colombia! Where should I shop/eat? Ha, well I haven’t visited my native land in almost 12 years (! ), so I could give you recommendations in case you’re in the mood to travel back in time. But I know the place has changed sooo much (for the better! ), I won’t even try. I’ll instead blog about my experience when I go back later on. 6. I started my own blog. Any tips? Yay! Blogging is an awesome outlet for expressing yourself. Feel free to check out the following tips, which cover most of the getting-started questions you might have. PS– I also design blogs! So if you’d like help w/yours, find out more about my blog design services. PS2- I’d be happy to check out your blog too and give you more feedback! I graduated with an Honors Bachelor’s degree in Marketing, a Minor in Rhetoric & Writing, and a Certification in Integrated Marketing Communication. I also recently obtained a second Bachelor’s in Psychology and submitted a manuscript for publication in a research journal. 8. What should I wear with ____________? Here’s a little-known fact about moi: While I don’t necessarily blog about fashion, friends often do come to me for fashion advice and to ask that same exact question. Teal, pink, red, and anything with cute owls. Did I miss something? Feel free to email me at Annie [at] TheRantingLatina [dot] com with your questions and please note whether it’s urgent in your subject line!